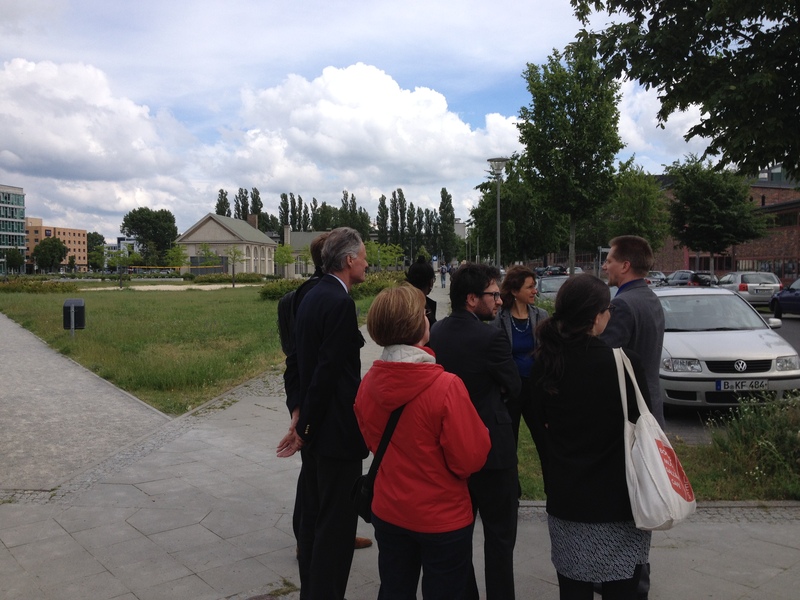 Last Thursday, the “Kreis der Wissenschaftsattaches” visited Adlershof, Berlin’s leading science center located in the South-Eastern district of Treptow-Köpenick. The Kreis comprises all science attachés of the embassies in Berlin. Adlershof currently comprises six institutes of the Humboldt University (all in the field of natural sciences and psychology), a media park, ten non-university research institutes and around a 1000 businesses. These all share a location with a rich history that breathes science and innovation. In 1909 Adlershof was inaugurated as Germany’s first airport for powered flights and soon hosted the German Research Institute for Aviation (DVL) that built a variety of wind tunnels that are still standing on the premises today. New institutions were founded by the GDR government that established the German Academy of Science at the site. The Academy was the leading scientific research institute for physics, chemistry, materials, aviation and space research in former Eastern Germany. When the Berlin Wall fell, 5.600 people were working at Adlershof’s research facilities. After the reunification the decision was taken to develop the area in a landscape combining commerce and science. Many of the institutes from the German Academy of Science continued either as a company or were incorporated within existing scientific organizations such as the Leipniz Gesellschaft. In 2009, the park celebrated 100 years of innovation and science and had become Germany’s largest science and technology park. The park contains both technology and incubator centers and allows scientist from a wide array of disciplines to network and easily meet each other. To further facilitate cooperation the non-university institutes formed the IGAFA regional network in 1992 (InitiativGemeinschaft Außeruniversitär Forschungseinrichtungen in Adlershof). For this goal, IGAFA organizes mutual events, conferences and other projects, it welcomes international guests, distributes literature etc. During the visit the science attachés were first introduced to the park, its history and IGAFA and then followed a guided tour through the park. The tour ended at the Helmholtz-Zentrum Berlin für Materialien und Energie. This institute operates BESSY II, a synchrotron radiation facility at Adlershof. 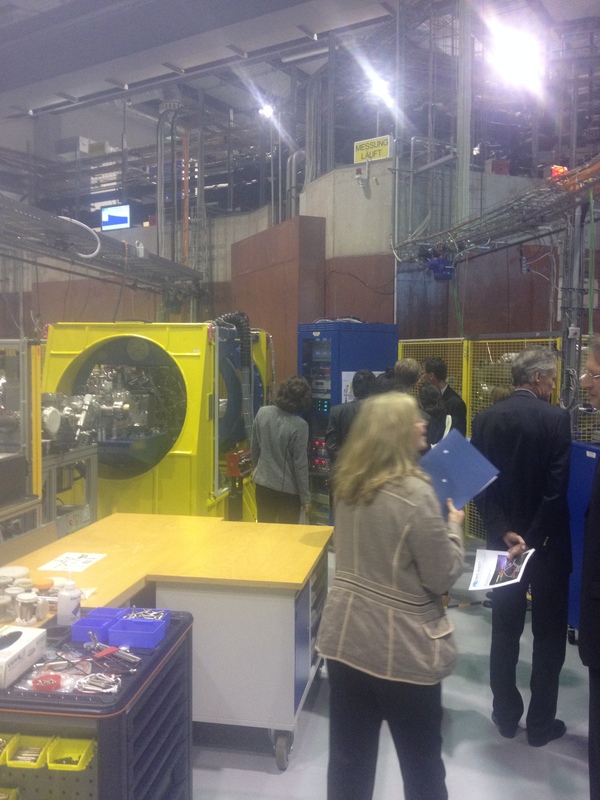 BESSY II supplies synchrotron radiation and provides support for science and industry. The installation operates in the VUV/soft X-ray range. Research groups from other universities or institutes can submit proposals for certain projects too. BESSY II is used to study the characteristics of energy and materials. Guided tour over the terrain. The visit then led to PTB (Physikalisch-Technische Bundesanstalt), Germany’s national institute for natural and engineering sciences and the highest technical authority for metrology (science of measurement) and physical safety engineering. It operates under the authority of the Federal Ministry of Economy and Energy. The PTB was founded by, amongst others, Siemens and Helmholtz and still serves both industrial and scientific purposes. Industry can use PTB’s facilities and expertise to calibrate instruments. ASML, the world’s largest supplier of photolithography systems for the semiconductor industry, for example uses PTB to precisely measure the Zeiss mirrors that are needed in the semiconductor industry. The tour ended with a presentation about Humboldt Innovation GmbH. This company links the university world with society and economy. One of its core tasks is ‘spin-off management’: providing assistance and sparring partners for spin-offs. Since its formation in 2005, the company has successfully nursed over 50 start-ups. In 2010, the OECD called Humboldt Innovation a ‘best practice’. With this visit the “Kreis der Wissenschaftsattaches” has started a series of events to explore the German scientific world.